Drama. BRAVE NEW PLAY RITES presents twenty years of original and startling theater from Canada's best young writers. The book is a collection of short one-act plays written by students in the Creative Writing Program at UBC and produced at the annual festival, Brave New Play Rites, for public performances. Many successful writers have had their plays produced in the festival, including Lynn Coady, Steven Galloway, Dennis Bolen, Kevin Chong, and Aaron Bushkowsky. 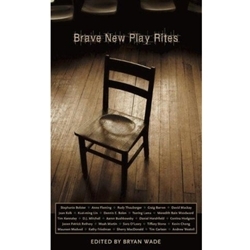 The release of BRAVE NEW PLAY RITES coincides with the 20th anniversary year of the festival, and the familiar names in this collection will be of interest both critically, and to readers who already follow the careers of these writers. The cart is currently empty. The Wish List is currently empty.